Pinakbet or pakbet is a popular Ilocano food, from the north of the Philippines, although it has become popular throughout the Philippines. The word is the contracted form of the Ilocano word "pinakebbet", meaning shrunk or shrivelled. The original Ilocano pinakbet uses baggoong, of fermented monamon or other fish, while further south, bagoong alamang is used. 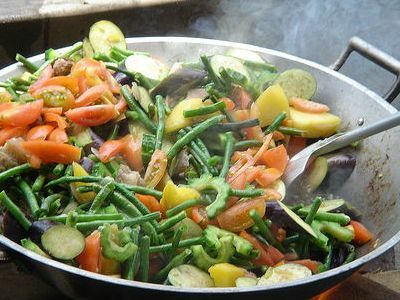 Usually its most basic vegetables used in this dish include native bitter melon, eggplant, tomato, ginger, okra, string beans, lima beans, chili peppers and various Filipino vegetables like parda, winged beans, and such. A Tagalog version usually includes calabaza. Most of these vegetables are easily accessible, and are grown in backyards and gardens of most Ilocano households. As its name suggests, it is usually cooked until almost dry and shrivelled, however, the flavors of the vegetables are emphasized and accentuated with the help of baggoong.